We are industry leaders in oil pan and engine component manufacturing. From our 30 years in the business we have improved and fine-tuned our process. We have partnered with some of the most innovative leaders in the industry. 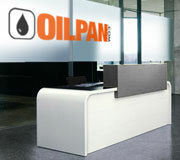 oilpan.com is a Manufacturer of Oil Pan Cores, Fabricated Oil Pans and other engine components. For over 30 years, oilpan.com has worked with an extensive list of household OEM & Aftermarket Manufacturers, Fabricators and Engine Rebuilders. From designing and blueprinting to manufacturing and distributing, oilpan.com offers a full spectrum of products and services to help your business go-to-market quickly and cost effectively. We specialize in oil pan core design, deep draw stamping and fabrication. Visit our product gallery for the latest stock replacement and fabrication ready oil pan cores and accessories. Copyright © 2010-2011 oilpan.com. An Alliance Manufacturing Company. All rights reserved.